Description: Human Resource Management in Cultural Organizations will be a highly participatory workshop that will examine best practices in HR planning and management, with an emphasis on the interconnected needs of the individuals and organizations, and strengthening your capacity to interact with, lead and develop your staff. The workshop will be tailored to the needs and priorities of managers in the live performing arts, and draw on participants? experience to enhance learning. Description: Come join Jenny Knott, Rosco paint product manage/scenic artist, and Wendy Waszut-Barrett, president of Historic Stage Services LLC/scenic artist, to get hands on practice and improve your painting skills over two days. Learn both contemporary and historic painting methods. We will explore creating metallic effects for both two-dimensional and three-dimensional applications. This class will provide options for future projects, whether you are painting backdrops, props or costumes. 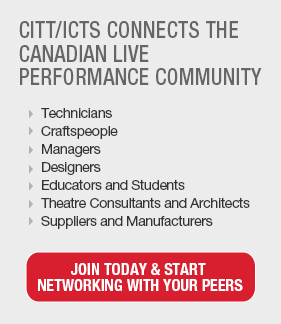 Add some glitter to your golden experience at CITT/ICTS this year! describe and apply the main functions of human resource management including: planning for succession, staffing (recruitment and selection), development (training, continuing professional education and competency development), compensation, and performance management. Tailor and apply HR management tools to build capacity in your organization. Support the role of governance and the development of HR policies within a live performing arts management context. recreate historic and contemporary techniques of painting light, shadow and reflective light; learn how get the most out of a paint brush; and add new resources to their library for historic and modern materials, references and elevations.